I can’t recall just how I came across Benjamin Vogt’s original blog, The Deep Middle, but I’ve been an avid reader of his writings for at least five or six years. His posts were always ones that sought to poke the bear, if you will, ones to provoke you into thinking about your own relationship to gardens and nature, or how we relate to our landscapes. When I found out he had a book being published I was intrigued to read a more in-depth treatise on his thoughts about what purpose/function our gardens should be serving and added it to my list of books to read for 2017. If you listened to Episode 3-11, I talked about all of the gardening books I read last year and his was one of them. My odyssey in taking a deep dive with how our gardens function beyond our desires as humans started with Bringing Nature Home and The Humane Gardener (see Nancy’s episode 3-5), and concluded Vogt’s book. While the first two bring more of a science and perhaps touchy-feely aspect to the story (and there’s nothing wrong with that at all! I like those aspects! 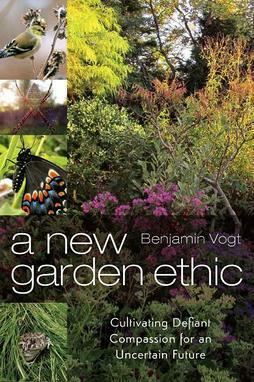 ), this book digs deep into our cultural and philosophical viewpoints as gardeners—and humans. It’s a gardening book and yet it can easily be applied to other aspects of social movements we have been experiencing in the US (and worldwide) the last several years. Honestly, this book deserves to be read, then re-read, and re-visited once a year to see how it still applies to our lives, and where we can better ourselves as gardeners and stewards of the land. If you are looking to be challenged on your views on gardening, this is an episode to listen to. And even if you aren’t looking to be uncomfortable with your plant choices in the garden, you should probably put some ear buds in and listen while you prep your garden for spring. A note on the audio: The audio my end is crackly. I seem to be having this problem more often when I record during my lunch break at work and not at home. I’m looking into the cause—bad wifi, too much electronics near my computer…not sure what is going on. I was not able to fix my portion of the audio to remove the crackles. Benjamin, however, comes in very clear and that’s what you want, to be able to hear him! Benjamin’s Houzz Articles: There are tons and a lot of great design information tucked in there!